There’s a lovely crafts market tucked behind the Habana Libre in Vedado. It used to be lovelier, maybe; but so did everything. I picked up two of the simple white linen pants there nearly the first time when I was about to photograph twins Jean and Omar on the Habana Vieja roof just off Animas. And so started my accidental induction of the diaphanous white pants. The pants – I picked up a spare pair a few years later and now I have three – are hermetically sealed and kept somewhere safe. Some new edits and outtakes with the inductees: Jean, Omar, Ricardo, Francisco, Marlon, Andro, Enrique, Jorge Luis, Daniel, Reinaldo, Alejandro, Geannys, AJ, Ramudo, Rafael, Jose, Angelito, Ricardo and El Toro. The first issue of @MALEsualityMag is available now. Get your copy at MALEsuality.com/mag featuring Joshua by Alex Hilbert, Mickey by Bradley Photo, and Ricardo by Kevin Slack. Illustration by the talented @wonkamon. Knowing that I called another model El Pingu, Geannys, the eternal seducer, was eager to win the title for himself. 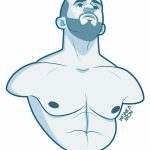 After many requests, I final release this set of over 60 uncensored and unseen images on onlyfans.com where Geannys proves why he deserves the title (and the free scrimmage shirt). If you think you have seen these before, you haven’t. If I get enough new signups on onlyfans, I will add this set to my portfolio here.